Revenue has started to grow steadily -- but the growth rate needs to accelerate for the retail titan to offset its rising costs. Shares of Wal-Mart Stores (NYSE:WMT) surged 9.6% last Thursday, after the retail giant reported better-than-expected earnings for the first quarter. Earnings per share came in $0.98, beating the average analyst estimate of $0.88. That was also better than Wal-Mart's own guidance for EPS of $0.80 to $0.95. The earnings beat showed that there is still a place for Wal-Mart in today's retail landscape. That said, the company still isn't producing the kind of revenue growth it would need to drive a sustainable return to strong earnings growth. Wal-Mart is in the midst of a multiyear turnaround plan designed to reignite sales growth -- and ultimately, earnings growth. To drive higher customer traffic, the company has raised wages and increased staffing to boost employee morale and customer service. It has also lowered some prices, improved its inventory management, and rolled out new technology to help customers find what they want. These efforts are starting to have an impact on the top line. Comp sales grew for the seventh straight quarter in the key Walmart U.S. business segment. Wal-Mart is also generating strong growth in its international segment when viewed in constant currency terms. Sales at existing Walmart stores rose for the seventh straight quarter. Image source: The Motley Fool. As a result, Wal-Mart's revenue came in ahead of analysts' expectations last quarter. This was encouraging, as a slew of major retailers have reported weak Q1 sales and earnings results this month. Nevertheless, it's too early for Wal-Mart shareholders to start celebrating. While Wal-Mart has been generating steady comp sales growth in the U.S., it's not growing very quickly. Comp sales rose 1% year over year at domestic Walmart stores and just 0.1% year over year at domestic Sam's Club warehouses (excluding the negative impact of lower fuel prices). Once again, the small-format Walmart Neighborhood Market chain was a genuine bright spot in the U.S. Its comp sales increased 7.1% year over year. Meanwhile, despite strong comp sales growth in most of Wal-Mart's international markets, net sales outside the U.S. still fell 7.2% year over year last quarter, due to the impact of the strong dollar. To be fair, though, currency movements are outside of Wal-Mart's control -- and they also drive offsetting cost benefits in international markets. Finally, global e-commerce sales rose just 7% year over year in Q1. Wal-Mart has invested heavily in this area, and management admitted that this was a disappointing result, given how fast online retail is growing in general. While Wal-Mart's EPS came in ahead of expectations last week, EPS still fell 5% year over year, while operating income was down 7%. Investments in higher employee pay, new technology, lower prices, and e-commerce infrastructure continued to weigh on Wal-Mart's profitability. The biggest contributor to Wal-Mart's profit decline was a recent wage increase benefiting more than 1 million employees. The year-over-year increases in wages should be smaller beginning next year, but wage inflation is likely to remain an ongoing headache, particularly if more cities and states implement higher minimum wages in the years ahead. As a result, Wal-Mart projected another year-over-year earnings decline for Q2. Looking further ahead, analysts expect a return to modest earnings growth next year -- but not nearly enough to offset the significant decline in Wal-Mart's earnings power over the past few years. 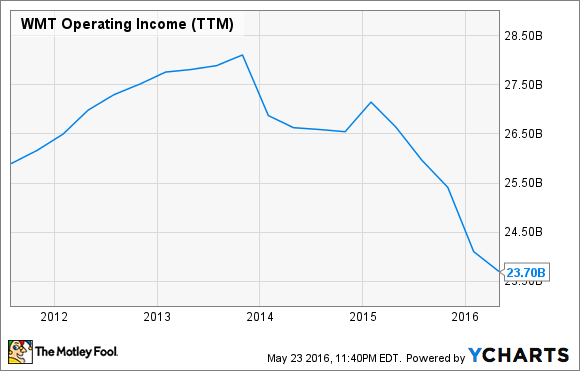 WMT Operating Income (TTM). Data by YCharts. Wage inflation isn't necessarily a bad thing for Wal-Mart. If many companies raise wages in order to retain their employees -- or if state and city minimum wages increase significantly -- it will put a chunk of extra disposable income in the pockets of Wal-Mart's core customers. In that context, 1% comp sales growth isn't adequate. Based on the relatively healthy state of the economy today, Wal-Mart should be able to grow sales at a higher rate. And Wal-Mart will need to do just that if it ever hopes to return to its historical level of profitability.